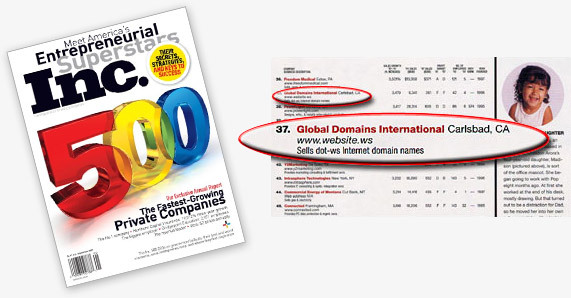 In the 2002 Special issue of Inc. magazine, GDI placed #37 on the Inc. 500 "List" of the USA's 500 fastest growing private companies and #5 in the state of California. "The truly exciting thing about GDI making the Inc. 500 List is the fact that we've barely even begun!" says Mike. "We've gotten to this level by serving only that tiny minority of Internet users who even know what a 'domain name' is and why they need one. We've actually begun to create a market by introducing .ws domains to the masses, with our turnkey, extremely affordable and easy to use packages of domain names, self-service instant websites, and personal email services. We're actually 'targeting' the other 99+% of the Internet community - families, single people, children, seniors, and small businesses - the vast majority of whom are new to domain names and just need something simple and affordable to get them excited. That is literally hundreds of millions of people globally who are prospects for our service." Copyright © 2019 by Global Domains International, Inc.